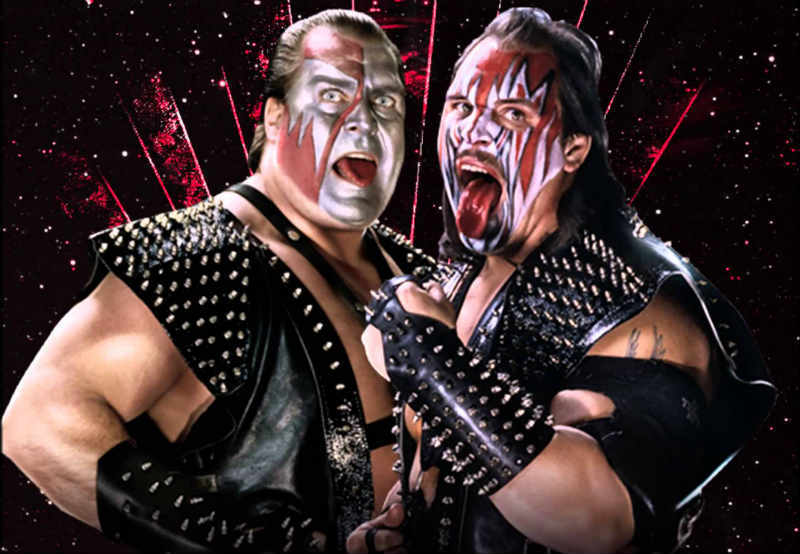 Throughout 1989 Demolition was a powerhouse of a tag team. They had some great rivalries with all of the hot tag teams of the 80s. Leading in to that year’s Wrestlemania, the WWF wanted to setup a great tag team title match. 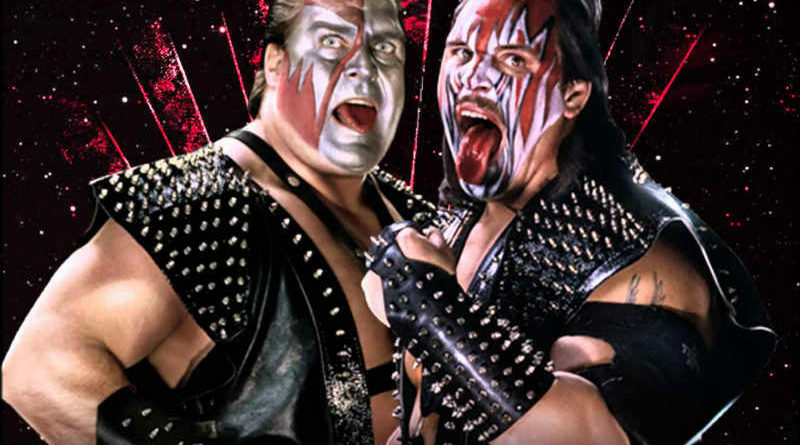 To accomplish this, in December of 1989 The Colossal Connection – in a shocking upset – beat Demolition to become the new tag team champions. Fast-forward four months to Wrestlemania VI and Demolition have their rematch. It was the second match on the main card. The crowd was loud, they were excited. I don’t think there was a person in the building who didn’t want Demolition to win. Andre The Giant was no longer the athlete that he was in the 70s. His back was basically destroyed and he was barely able to wrestle anymore. Haku fought Demolition all by himself without once tagging in The Giant. From the ring apron, Andre was doing his damage behind the referee’s back. Punching, head butting, and choking with the tag rope. Ax was being man handled by both members of The Colossal Connection. As the match was nearing its climax, the crowd began to ramp up in excitement. Ax finally makes the tag to Smash. Smash comes, clears house. As Andre The Giant enters the ring and grabs Smash; Haku begins to wind up for his side kick. It’s looking a lot like how Demolition lost the titles back in December. This time, Smash ducks, Haku kicks The Giant and he ends up tangled in the ropes. Smash quickly capitalizes on the mistake by grabbing Haku and setting him up for Demolitions finisher – The Demolition Decapitation. As he does the crowd is going absolutely crazy. Up to this point in my life, I haven’t heard a crowd cheer so loud. It was incredible. This was Andre The Giant’s last televised match with the WWF. It was quite fitting as he was able to turn back to a baby face by splitting with long-time manager Bobby The Brain Heenan. I thought they was better than the Legion of Doom in the WWF,but not better than the Road Warriors in the NWA! Plan A back in ’89 was for Demolition to win the titles back off of The Brain Busters at WM6. But then Tully and Arn started wanting to go back to WCW, so on Oct 2nd at a TV taping in Wheeling, West Virginia. two segments were filmed – (1) a tag title match which ended with illegal man Ax pinning illegal man Blanchard, Demolition being awarded the title and leaving with the belts (2) a Brother Love show segment where Heenan announced he’d dumped the Busters and was now introducing Andre and Haku as his new team to unseat Demolition. Then after the cameras switched off, it was announced to the live audience that the decision on the tag title match had been reversed pending an investigation and until then the Busters were still champions, so Heenan settled up with them and they all left together. This footage was kept in reserve so that if Arn and Tully went back to WCW, the two segments could be aired and then Andre and Haku could win the titles and there would still be a Demolition title win over a Heenan-managed team at WM6. Life carried on for a few weeks until Tully failed a cocaine test. The WWF immediately ran both segments on TV, pulled Tully from all live shows including the Survivor Series and basically fired him (while WCW when they heard about it withdrew their interest in Tully and cut back on their money offer to Arn). Tully ended up in the AWA, while Arn stayed around just long enough for the Survivor Series before heading back to WCW alone and unhappy. The Colossal Connection’s title win then went ahead in December and Plan B ran to its conclusion at WM6.